Join millions of players worldwide in DungeonRush, the unique IDLE card RPG!! Collect legendary heroes, form a battle-hardened team, fight with other players, and accomplish legendary achievements. You can also form a guild with other players to rule the DungeonRush universe! Once you’ve unlocked a dungeon, it’s ripe for the reaping with Dungeon Rush’s Auto Battling feature. 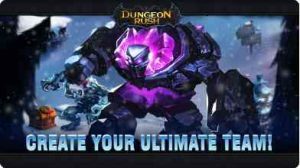 Set your heroes to work clearing out the dungeon and they will rush in and battle through gaining experience, gold, and items along the way. You don’t even have to be in the game to win the rewards of your heroes’ auto Battling! 1. Auto battle in the background while you’re free to do other things. Check back later to collect your new equipment and see your heroes’ progress.